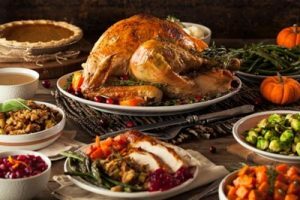 This Thanksgiving, let the culinary team at Grand Millennium Dubai Barsha Heights do the cooking so that you can relax and spend a wonderful evening with your dearest and nearest. The “Tom Turkey” promotion priced at Aed499 allows your family and friends feast on succulent roast turkey with all the traditional trimmings in the comfort of your home. Orders can be taken as early as 20th November 2018. The 7kg roast turkey with chestnut stuffing serves 6 to 10 people and is served along with herb-roasted baby potatoes, buttered carrots, caramelized Brussel sprouts, glazed chestnuts and veal, chipolata sausages, cranberry sauce and giblet gravy. A mouthwatering pumpkin pie for dessert is also included. Skip the stress of shopping, cooking and cleaning and let our chefs take care of everything so that you can relax and enjoy more time with your loved ones. All you have to do is call +971 4 429 9999 or message the hotel via WhatsApp at +971 55 561 2122. Orders must be placed 48 hours in advance and your beautifully packaged turkey takeaway box will be ready for pick-up at the hotel’s Concierge.